Royal Obidos has your typically modern, but excellent clubhouse, with fabulous views of the course and the coast not that far away. There is also a new hotel and spa located a short walk from the course, ready for those golfers looking for a bit of luxury with their golfing break. You can see straightaway that there are plans for villas to encircle the course, and there’s an ultra-modern show home close to the first tee to entice those with a healthy bank balance. The course itself was not overly long. Although it was a bit hilly in places for this middle aged golfer to be carrying, so I made a mental note to rent a cart the next day! Thankfully the winds had died down a little, so it felt like we had a chance to play some decent golf. The course itself was in great shape. Fairways were lush but firm. Bunkers were great, although a touch too much sand in a few of the fairway bunkers. However it was the greens we enjoyed the most, as not only were they firm, fast, with some devilish slopes, but they were absolutely true. Once you have played this course once, you realise that the master that was Seve had built a layout which was tricky to the unwary, with water very much in play on just about half the holes, and a few holes that offered you that risk or reward shot. The best of which had to be the 12th. Decisions, decisions. Take on a 230 yard drive over the water and leave a short iron to the green, or play safe with a 210 yard tee shot left of the water and leave yourself a 185 yard second shot into a medium sized green. 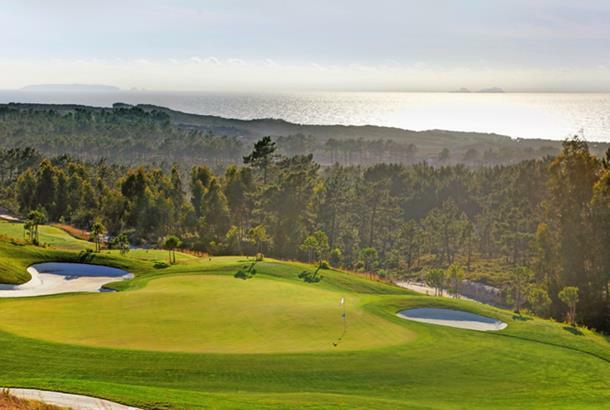 So what was the most exciting thing about playing Royal Obidos? Well besides playing it again the next day, it had to be the fact that this course will only get better! When we weren’t golfing, we were wandering around the famous walled settlement of Obidos, or the town of Peniche on the coast. I know for sure it won’t be my last visit to the Silver Coast.